Definition at line 17 of file CModelParameterGroup.h. Definition at line 21 of file CModelParameterGroup.h. Definition at line 20 of file CModelParameterGroup.h. Definition at line 11 of file CModelParameterGroup.cpp. Referenced by add(), and copy(). Definition at line 16 of file CModelParameterGroup.cpp. Definition at line 26 of file CModelParameterGroup.cpp. Definition at line 95 of file CModelParameterGroup.cpp. 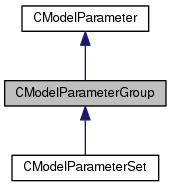 References CModelParameter::CModelParameter(), CModelParameterGroup(), CModelParameter::Compartment, CModelParameter::Group, CModelParameter::Model, CModelParameter::ModelValue, CModelParameter::Reaction, CModelParameter::ReactionParameter, and CModelParameter::Species. Definition at line 133 of file CModelParameterGroup.cpp. Assign the content of the source group to this, i.e., copy all contained parameters. Definition at line 31 of file CModelParameterGroup.cpp. References begin(), clear(), copy(), end(), and CModelParameter::Missing. Referenced by CModelParameterSet::assignSetContent(), and CModelParameterGroup(). Retrieve the iterator pointing to the first contained parameter. Definition at line 169 of file CModelParameterGroup.cpp. Referenced by applyValueToParameterSet(), assignGroupContent(), CQParameterOverviewWidget::buildSelectionList(), clear(), compile(), diff(), CModelParameter::getIndex(), getModelParameter(), CQParameterOverviewDM::getRow(), CQParameterOverviewDM::index(), refreshFromModel(), remove(), CCopasiXML::saveModel(), and updateModel(). Retrieve the const_iterator pointing to the first contained parameter. Definition at line 179 of file CModelParameterGroup.cpp. Clear the contained parameters and delete them. Definition at line 202 of file CModelParameterGroup.cpp. References begin(), end(), mModelParameters, and pdelete. Referenced by assignGroupContent(), CModelParameterSet::createFromModel(), and ~CModelParameterGroup(). 204 // Clear existing model parameters. Definition at line 189 of file CModelParameterGroup.cpp. References begin(), CModelParameter::compile(), and end(). Referenced by CModelParameterSet::assignSetContent(), CModelParameterSet::CModelParameterSet(), CModelParameterSet::createFromModel(), CQParameterOverviewWidget::enterProtected(), and CModelParameterSet::updateModel(). Definition at line 54 of file CModelParameterGroup.cpp. References CModelParameter::CModelParameter(), CModelParameterGroup(), CModelParameter::Compartment, CModelParameter::getType(), CModelParameter::Group, mModelParameters, CModelParameter::Model, CModelParameter::ModelValue, CModelParameter::Reaction, CModelParameter::ReactionParameter, and CModelParameter::Species. Referenced by assignGroupContent(), and diff(). Definition at line 218 of file CModelParameterGroup.cpp. References begin(), copy(), end(), CModelParameter::getType(), CModelParameter::Group, CModelParameter::Identical, CModelParameter::mCompareResult, CModelParameter::Missing, CModelParameter::Modified, CModelParameter::Obsolete, CModelParameter::Reaction, CModelParameter::Set, and CModelParameter::setCompareResult(). Referenced by CModelParameterSet::compareWithModel(), and CQParameterOverviewWidget::leave(). 222 // We can only work on reactions, groups or sets. Retrieve the iterator pointing past the last contained parameter. Definition at line 174 of file CModelParameterGroup.cpp. Referenced by applyValueToParameterSet(), assignGroupContent(), CQParameterOverviewWidget::buildSelectionList(), clear(), compile(), diff(), CModelParameter::getIndex(), getModelParameter(), CQParameterOverviewDM::getRow(), refreshFromModel(), remove(), CCopasiXML::saveModel(), and updateModel(). Retrieve the const_iterator pointing past the last contained parameter. Definition at line 184 of file CModelParameterGroup.cpp. Definition at line 427 of file CModelParameterGroup.cpp. Definition at line 370 of file CModelParameterGroup.cpp. References begin(), end(), getModelParameter(), CModelParameter::Group, CModelParameter::Reaction, and CModelParameter::Set. Referenced by CQParameterOverviewDM::assignmentData(), CQParameterOverviewWidget::buildSelectionList(), CModelParameterSpecies::compile(), CModelParameterReactionParameter::compile(), getModelParameter(), CModelParameter::refreshFromModel(), and CQParameterOverviewDM::setData(). Definition at line 394 of file CModelParameterGroup.cpp. Definition at line 421 of file CModelParameterGroup.cpp. Definition at line 322 of file CModelParameterGroup.cpp. References begin(), end(), CModelParameter::Identical, CModelParameter::mCompareResult, CModelParameter::Missing, and CModelParameter::Obsolete. Referenced by CModel::refreshActiveParameterSet(), and CCopasiDataModel::saveModel(). Remove the given parameter from the group. Note, the parameter is not deleted. Definition at line 138 of file CModelParameterGroup.cpp. References begin(), end(), and mModelParameters. Definition at line 153 of file CModelParameterGroup.cpp. Definition at line 164 of file CModelParameterGroup.cpp. Referenced by getChild(), getNumChildren(), and CQParameterOverviewDM::index(). Definition at line 306 of file CModelParameterGroup.cpp. A vector of pointer to the contained parameters. Definition at line 179 of file CModelParameterGroup.h. Referenced by add(), begin(), clear(), copy(), end(), getChild(), remove(), and size().